Anyone can shop and everyone can SAVE! This is one event you have to see! Children and strollers welcome all PUBLIC sale days. Check the Schedule to find your favorite time to shop. Keep up with growth spurts at JBF! The kids look GREAT and you feel SMART! We prefer cash or check and also accept Mastercard, Visa and Discover. 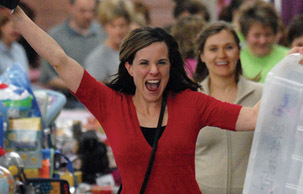 Shop 30,000 square feet of bargains - organized by size, gender and category. We'll give you a map, a shopping bag, and you can shop 'til you drop! Kids are free and you can be too. Like us on Facebook for Free coupons! Enjoy FREE admission for the rest of the public sale! Friday, Feb. 15 | Half-Price! Saturday, Feb. 16 | Half-Price! The Cleveland County Fairgrounds is conveniently located three miles off I-35 on Robinson Street. "The people in charge are very supportive, especially of first time consignors. " Volunteering to earn a presale pass and earning extra percentage back on my consignment items. Kathy is so nice to volunteer for! Good deals and a wonderful staff. Hello, I'm Kathy and I organize the JBF sale in Norman as well as OKC and Edmond. I started this event in my living room 19 years ago, since that time we have helped thousands of families just like you clean up and cash in with JBF. As a mom, I get it! Raising kids on a budget is tough - not to mention they grow out of things so fast. That's why we created a community event where local families can sell the items their kids no longer use, and restock their closets each season! It's a win-win and why I love JBF...I know you will too!